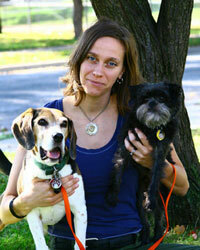 Dallas Rising is the program director for the Animal Rights Coalition, an organization in Minneapolis founded in 1980. She was at work when two people walked into the group’s storefront office. “I thought they were going to try to sell me internet service or something,” she says. Then they flipped their badges and said they were with the FBI. “The guy said ‘Can I talk to you’ and I said ‘No, you can’t,'” she says. She called her boss to confirm that the group would have nothing to do with the FBI, and then asked them to leave. According to Molesky and his partner, Elizabeth Pauling, who said she is an FBI analyst, this would mean that if anyone approached Rising with information about animal welfare violations, she would tell FBI agents about the place of concern so that they could urge the USDA to conduct an investigation. The visit occurred a week after two other unusual encounters at the Animal Rights Coalition. Someone had called the office saying he knew about a farm in Wisconsin abusing animals and that he wanted help “to get in there” through an Animal Liberation Front style action, Rising says. And just days earlier, a newcomer to an activist training session was asking other attendees how they feel about blowing up buildings and killing people. In both cases, Rising said the individuals were immediately told that the Animal Rights Coalition was not involved in illegal activity. But the encounters were surprising to local activists because the group is known for organizing non-violent protests, hosting speakers, and coordinating vegan outreach. The FBI has a long history of using informants to surveil, harass, disrupt, and entrap political activists. As I’ve documented at length on this website, the heavy-handed tactics of the COINTELPRO era have not disappeared — they have been repackaged as counter-terrorism efforts. This may take the form of threatening activists in hopes they will become informants (as I experienced personally), or attempting to infiltrate vegan potlucks. In the case of Eric McDavid, an undercover FBI informant named “Anna” repeatedly attempted to coerce him and others into illegal activity. He refused, and yet was sentenced to nearly 20 years in prison on conspiracy charges. So is this emphasis on “liaisons” a reflection of a kinder, gentler FBI? “Ag Gag” bills have been introduced across the country, and passed in Iowa and Utah, targeting undercover investigators who expose animal welfare abuses on factory farms. As discussed in my recent interview with a current undercover investigator, these activists are at risk — not for underground, ALF sabotage, but for non-violent investigations affiliated with mainstream organizations. This new emphasis on using liaisons to find out farm names, at a time when investigators are being targeted for videotaping farms, is certainly noteworthy. Minnesota considered its own “Ag Gag” bill recently, co-sponsored by Representative Rod Hamilton — past president and current member of the Minnesota Pork Producers. In other words, activists should know that there is no such thing as providing the FBI with innocuous information. Drawing a distinction between a “liaison” and an “informant” is clever, but keep in mind that this is the same FBI that says undercover investigators can be prosecuted as terrorists. The two FBI agents who visiting Dallas Rising attempted to reassure her that they were only interested in fighting criminal activity and terrorism, and that they would protect her First Amendment rights. Her response? Molesky has not returned phone calls for comment. These FBI agents said they would be “reaching out” to other organizations. If visited by the FBI, know your rights and call an attorney. Next post: Why Are Environmentalists “Terrorists,” But Anti-Abortion Extremists Are Not?